This, if anything, would be the only repeat of banners we've seen in this section (and I've pretty much covered everything within this range, except for a few stores to the east). And that's only if you count the closed Fine Fare up by 70th St. This Fine Fare is probably an old chain supermarket. It's even a possible former Acme, given the tower shown on the corner here. While it's possible that it was installed by a later tenant, it's rather unlikely. This supermarket became a Super Supermarket, which also replaced a Mayfair Foodtown that replaced the Acme in Orange. So it's possible the same thing occurred here. In any event, Super closed or was replaced somehow by Super Fine Fare between 2007 and 2012. Fine Fare appears to have expanded the store slightly. Produce is in the first aisle, which is double-wide. Refrigerator cases along the wall and bins in the center. There was actually a very good selection for a small store, and the whole area is very clean. Recognize this image? It's the one I used for the graphic for the whole group of stores. And by the way, the floor looks to be in pretty bad shape here, but a recent revisit revealed that large sections of the floor were torn up, so they're probably going to at least patch the worst parts, if not install a totally new floor. Recognize this decor? It's not far from what we saw at NSA in New London back in January if you remember...and if you can see it behind the giant pots. I have one more store photographed with the same or similar decor, but without the awnings. Here's a look down the back aisle, with dairy and packaged meat lining the back wall. A little cramped, but impeccably clean. The somewhat awkward circular Fine Fare logo is a decal stuck over the circular Super Supermarket logo. The floor has been patched so many times that the patterns seem to be totally random at points. But at least they're aware that their floor needs help and are working on it. And can anyone tell whether those are fans or heaters? 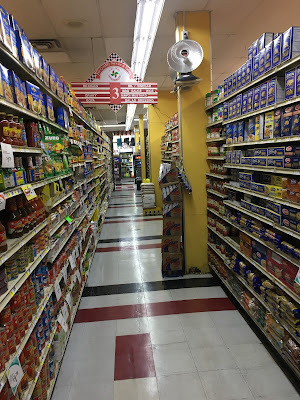 The last aisle (to the right in the above photo) contains frozen foods and the butcher/deli, with soda and other beverages in the alcove to the left, up a slight slope. 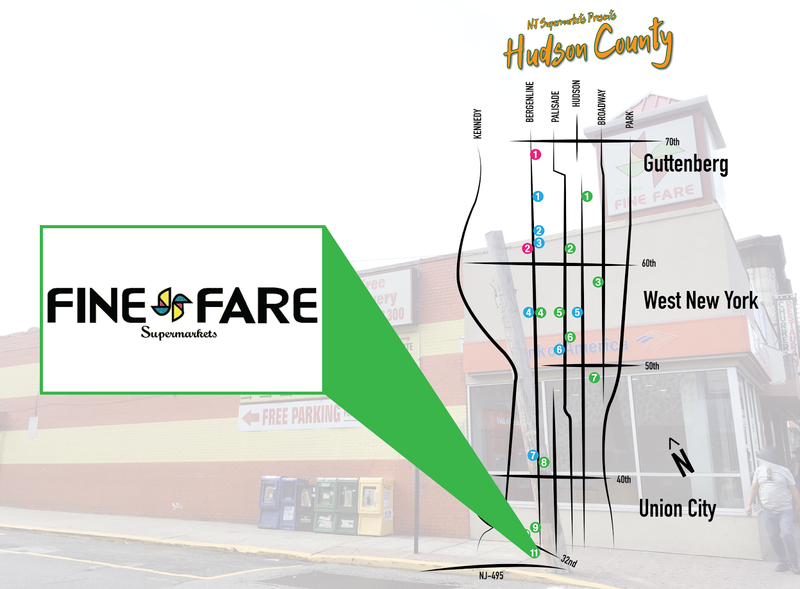 The windows look out onto 33rd St (there is a restaurant between Fine Fare and Bergenline), but you can almost see Despensa from Fine Fare's windows. I do not mind the lack of artificial plants in this version of the decor. Although I did like the wavy green stripes over produce that NSA had. Frozen foods are opposite this service counter. Again, some crazy floor patterns, but very clean. 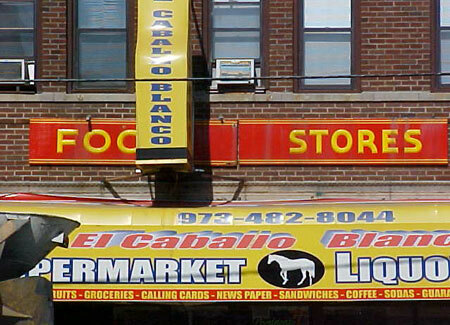 The surprise was not the red-and-yellow striped wall, but this SUPER MARKET sign! I immediately recognized this as an A&P sign. What I didn't know was just how old it is. Based on this 1940 photo from Groceteria, we can date it to approximately the late 1930s/early 1940s. The signs were still in use in the 1950s, and in the late 1930s, smaller stores received "FOOD STORES" signs of a similar style (again, from Groceteria). This 1949 photo shows the same style sign, but obviously with some wear. And by 1959 (their 100th anniversary), A&P had begun using all-new signage for the Centennial or Colonial stores. Even before that, there was modified signage for the new stores. So that settles the age question. The second question, in my opinion, is where is the sign from? 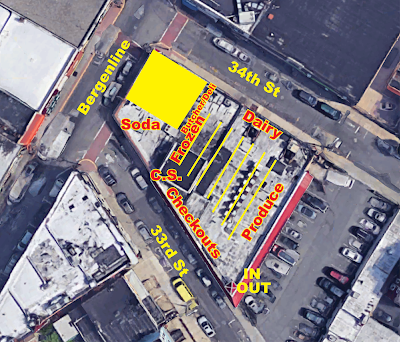 If this particular location was a 1935-1945 A&P, I would assume that they'd orient the building to face Bergenline, not with its back to Bergenline. 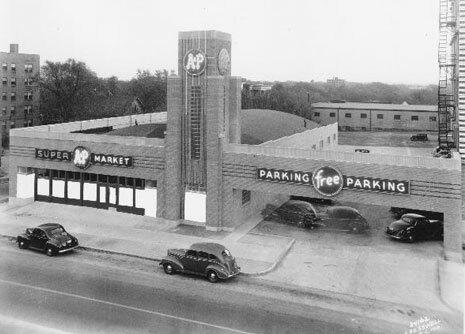 A&P generally put its parking lots in front of the store, when they had them, not behind. This arrangement seems more like an ACME to me, but I have no evidence to back that up. So then, it stands to reason that this sign was removed from a nearby A&P. Does anyone know where one was? 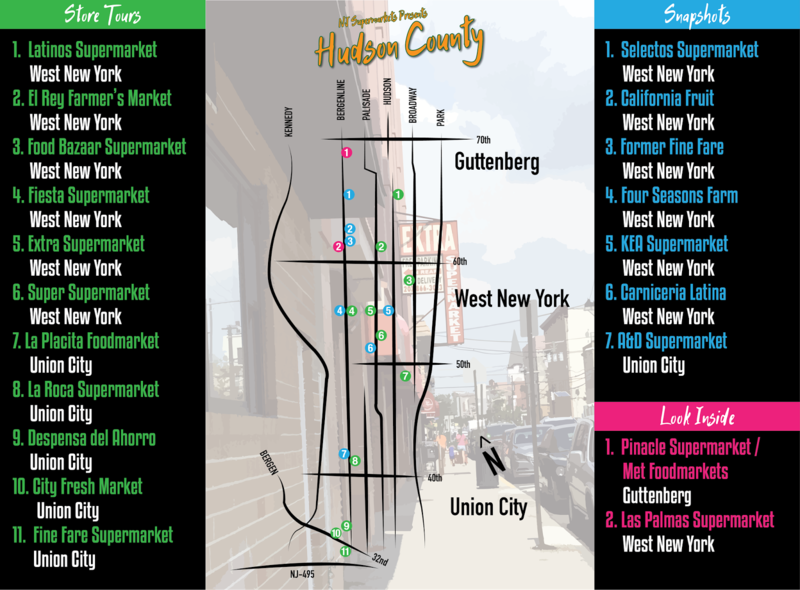 There was one much later in nearby North Bergen, which opened in the 1970s and closed by the time the new Waldbaum's (later A&P and Food Basics and now Food Bazaar) in North Bergen opened. If you know anything, please let me know! And with that...our Hudson County group is over! 20(+1) stores with basically no repeats. 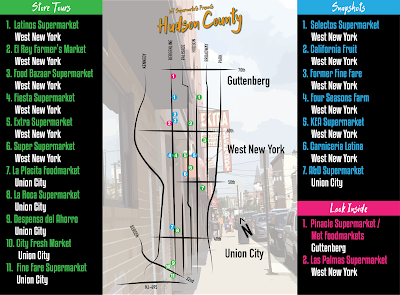 I hope to one day get back to the area and cover some stores below 495 and in Jersey City--but since it was 90 degrees this day, maybe I should do that when it's 15. That averages out to be 52.5 degrees, quite comfortable! We will resume normal posting on Friday with a Snapshot in Morristown, NJ. Very cool find with that old A&P sign! (Heads up though, I'm not seeing any of those Groceteria links.) Congrats on completing this series (and since I haven't said it yet, on the blog's rebrand as well)! Well, the first problem was simply that I didn't see your hyperlinks, lol. I guess my tired eyes didn't pick up on that this afternoon, haha! I see them now, but coincidentally, they indeed did not work... but those URLs did, so thanks for those! Not your problem at all...there wasn't enough contrast between the link color and the text color. I changed it to a brighter red, so hopefully that looks a little easier. 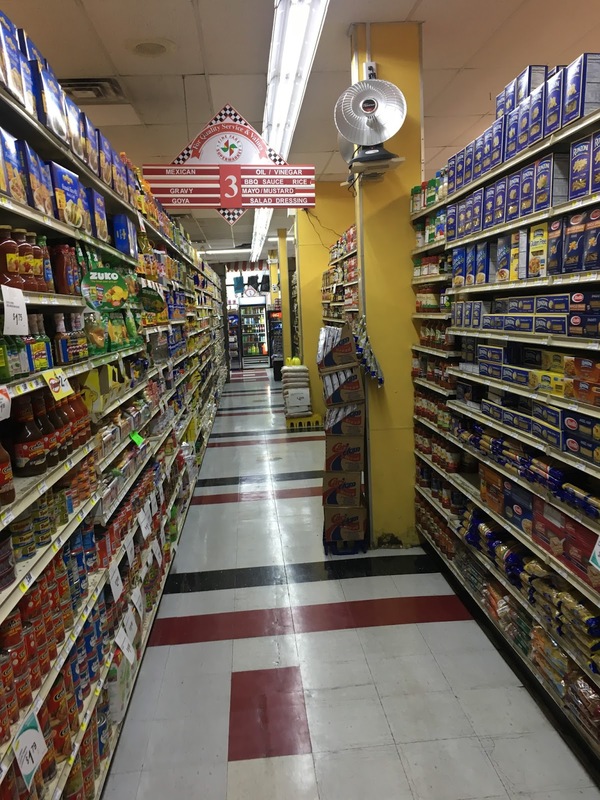 Groceteria may have a non-link code or something on their images. Interesting sign. I'm a bit shy on the very old A&P signage... but it's definitely from an A&P, obviously. This location couldn't have been an Acme before... the tower is too small and irregular; it was most likely added by a later tenant. 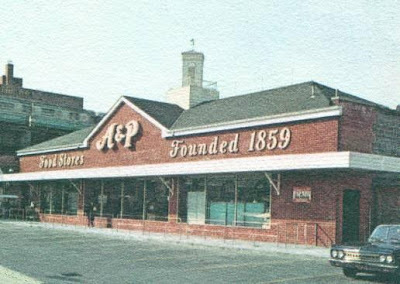 It could have been a no-frills A&P before the current tenant arrived with a small, flat tower. Historic aerials (1995) show that the awning and tower were added sometime in the 2000's, deeming this location an A&P, so the sign would have come from this location. You're right about the tower. I also realized there are actually two towers, one on each end of the building, which Acme would never have done. So probably, when A&P renovated or another store (Super) took over, they just moved the existing Food Stores sign to the side of the building. Thanks for the history!